The Lynch Barn was built in the early 1800s. It was built with wooden beams and pegs. Throughout the years, the barn has had multiple advertisements painted on it and multiple paint coats. Because of different paint coats, the advertisements are starting to show through. This has caused the barn to be considered a ghost barn. During the Civil War, the farm was raided by Confederate soldiers. During the raid, they took all of the horses but left one before crossing the creek because of a broken leg. To this day, it is a fully functional barn that houses cows all year round and sometimes pigs. The owner also still uses the top floor to store hay. The barn was built and owned by Stillwell and Rachael Truax up until September 1848, when they sold it to Robert McKee. After his death, his wife, Sara sold the barn to their sons, Amos Wesley and James Pott McKee. James Pott passed it down to his daughter and her husband, Mary and Virgil Lynch. It has been in the family for six generations. On the barn are four barn quilts. The barn quilt on the west side of the barn is a dinosaur. The dinosaur represents the Sinclair Oil Company advertisement that was painted on the barn for years. The barn quilt that can be seen on the east side of the barn is a horseshoe. The horseshoe represents the nick name for the turn. People in the area call the turn the “horseshoe turn”. The block on the north end of the barn is called Nova, a nova is a star that brightens suddenly before returning to its original intensity. That seems fitting for this block on the horseshoe curve...coordinated bright colors bursting in all directions on a barn that can be seen from all directions. 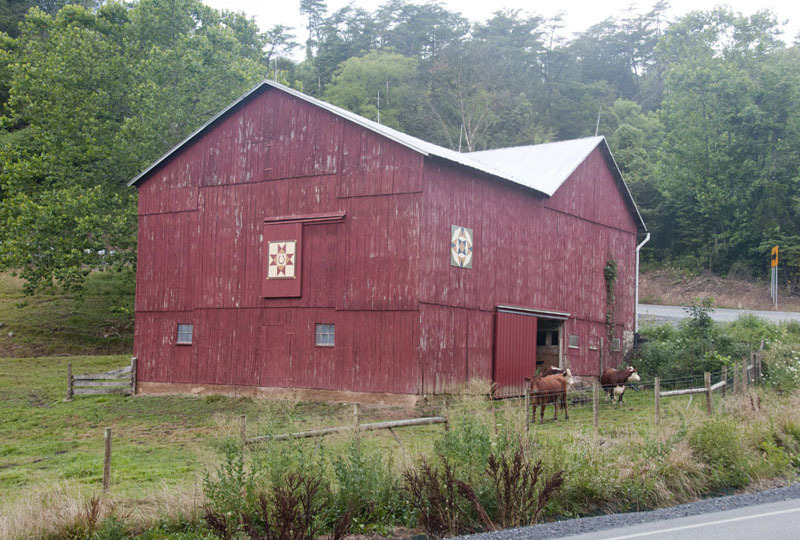 And the block on the South end is The Lynch Compass, representing the four sides of this barn that can be seen from the same road. The North, South, East and West sides are all visible while traveling around the curve.